(CNN) -- North Korea has begun reprocessing fuel rods, its Foreign Ministry said Saturday, according to state-run media. 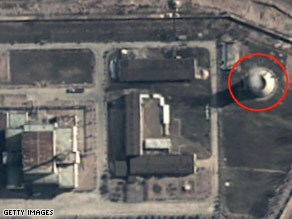 A satellite view of the nuclear facility at Yongbyon. "The reprocessing of spent fuel rods from the pilot atomic power plant began as declared in the Foreign Ministry statement dated April 14," a ministry spokesman said. "This will contribute to bolstering the nuclear deterrence for self-defense in every way to cope with the increasing military threats from the hostile forces." North Korea, angered by the United Nations Security Council's unanimous condemnation of a rocket launch, has threatened to walk away from the six-party talks aimed at disarming the country of nuclear weapons. It has said it will restore its disabled nuclear reactor. The six-party talks -- involving China, Japan, North Korea, Russia, South Korea and the United States -- have been aimed at persuading North Korea to scrap its nuclear program. Secretary of State Hillary Clinton, during an unannounced visit to Baghdad, Iraq, said the United States and its partners are working to resume the discussions. A U.N. panel Friday targeted three North Korean companies to have their assets frozen in response to Pyongyang's April 5 rocket launch. The companies that made the list were Korea Mining Development Trading Corporation (KOMID), Korea Ryonbong General Corporation and Tanchon Commercial Bank. U.N. member nations that have dealings with those companies must now freeze their assets. A presidential statement from the Security Council on April 13 authorized the sanctions panel to update a 2006 resolution barring North Korea from launching ballistic missiles after Pyongyang launched what it said was a communications satellite after weeks of warnings from the West not to do so. North Korea declared the launch successful, but U.S. officials said the missile's payload fell into the Pacific Ocean shortly after the launch. Japan, the United States and the United Kingdom had sought a new resolution imposing new sanctions on North Korea, but China and Russia -- permanent members of the Security Council with veto privileges -- blocked the way.